There are few artists making great music full stop and keeping it tight and delivering quality each time they release music.Kaiserdisco are definitely Made in Germany and a duo that therefore has the respect of the whole dance scene.Kaiserdisco manage to pull off that contradictory trick, producing modern cutting edge tracks with a nevertheless timeless and classic feel. Kuala the a-side track is an ethno natured track with lively bassline and uplifting small melody stabs, smithereens of vocals and a superb drive. Beneath all of this you find the Kaiserdisco FX department works with every possible production skill to keep the seemingly never ending loop active and rocking.Kuala is a firework of a rhythm monster! 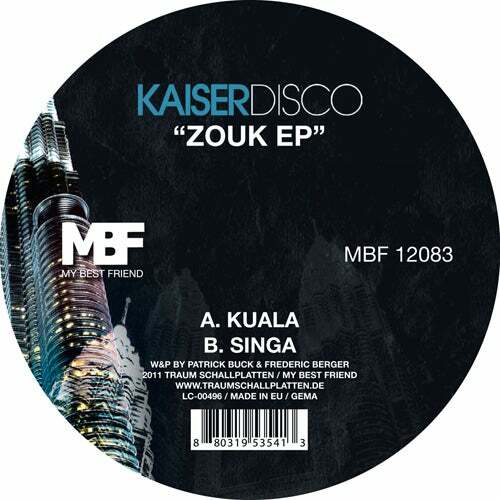 For the more traditional Kaiserdisco fan, youll find on the flipside with Singa another powerful tool of a track. Kaiserdisco keep a beat tight and introduce a lot of rising cool sounds building up lots of vertical hands up in the air energy!